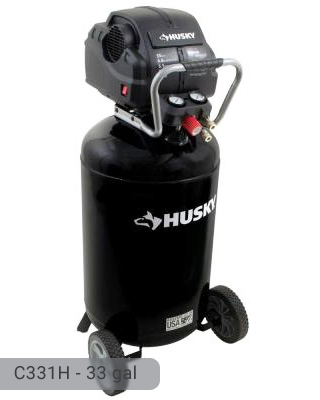 Air compressors can be very noisy during its operation but when you use Husky 33 Gallon Air Compressor (Model #C331H), this problem is eliminated. At only 78 decibels, the tool will run quietly which makes it very usable even for indoor purposes. It still makes certain sounds though, but they are quieter than what you expect from air compressors. 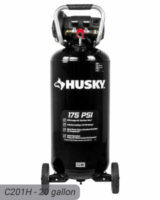 Husky 33 gallon air compressor is very portable. Unlike other models which have smaller ones, this model has 9-inch semi-pneumatic wheels that is perfect for transporting the tool wherever it is needed. It weighs 124 lbs. which makes it heavier than other air compressors. However, this weight is mainly due to its huge tank capacity. Relatively, it is still light in terms of portability. It has a steel handle with a rubber-like material on the center that will give you a good grip of the tool. It is a bit bulky but would not take too much space in your work environment because of its vertical orientation. 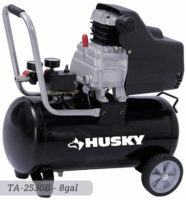 It runs at 1.7 HP making it a powerful tool for both domestic and industrial purposes. The pump is oil-free and can deliver up to a maximum of 165 psi. At 90 psi, it provides 5.1 SFCM while at 40 psi, it gives 6.8 SFCM. With these specifications, it is ideal for use in a lot of tasks such as air brushing, nailing, stapling, spraying, and framing. The gauge automatically shuts off at 165 psi but if it doesn’t due to minor defects, the safety valve would ensure that it would shut off. Because of this, 100% safety is guaranteed. Since the pump is oil-free, it can also be considered as maintenance-free because you don’t have to change the oil regularly. Also, you would not see oil residue outside the tank which can make your workplace messy. For those who have a hectic schedule, the air compressor would not be bothersome. 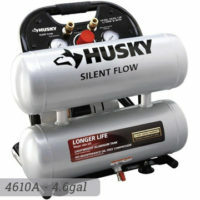 It has bigger tank capacity (33 gallon) than other models such as the 8 gallon or 20 gallon air compressor tanks. Because of this, it also offers a greater pressure rate, higher performance, and longer run time. Despite its size, the tank still fills quickly. The tank is made of steel and is approved by AMSE so you would not have to worry about durability and safety. 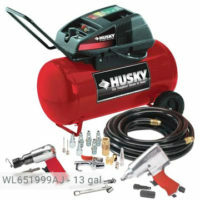 Husky 33 gallon air compressor is equipped with a high-flow regulator that can deliver more usable air and power other tools. It is very compatible with air ratchets, drill, and wrenches. These tools will still run even when the tank is still recharging. There are no accessories included in the air compressor. If you get stressed easily with damp air that usually come out of air compressors, you just have to purchase an air filter/dryer. 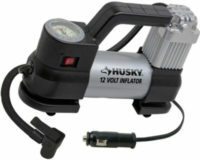 If you are planning to buy an air compressor for simple garage work, this one will work best with you. It has enough power and capacity that can operate all throughout the day. Make sure to check this one out when you visit your local home equipment store. If you already own Husky C331H model or just want to buy it you can share your review or ask a question through the form below. Can i used paint gun with it compressor? It more dependent on the particular task. 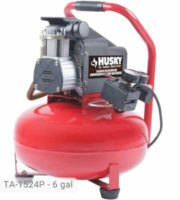 33 gallon air compressor is enough for comfortable work with paint gun, but you can buy and bigger one. The larger tank – the longer you will be able to paint without having to wait until the compressor is pumped back air into the tank. For the paint gun CFM output is the most critical specification. You should pay more attention to how many CFM requires your paint gun. If the air compressor has too low CFM output then you’ll be waiting for the compressor to catch up. The little black hose by the valve or something right there is leaking air how do I get that repaired? Where is this compressor made? What country? Please let me know ASAP. Thank you! My motor crapped out and the brushes are ruined. they scarred the end the brushes go against. its a husky 33 gallon , what are my options? Is this compressor enough to break lug nuts? Where can I purchase a rebuild kit for the regulator on the c331h? ?